. . .Since he didn't, he only whined a bit through his nose. You couldn't have told what he meant by the sound. Miss Kitty Cat didn't like his whining. She even opened her mouth wide and said as much. She made an odd hissing noise, which amused old Spot greatly. And he told Miss Kitty, in what was almost a growl (except that it wasn't loud enough for one), "Wait till I catch you out of doors, my lady! I'll have some fun with you." Then Farmer Green's wife opened the door and told Spot to be gone. "You ought to be ashamed of yourp. 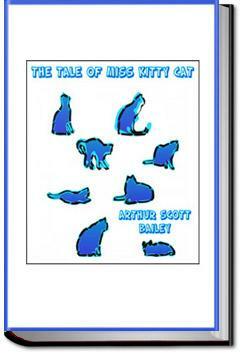 7 self—" she scolded—"teasing a poor little cat!" Old dog Spot tucked his tail between his legs and crept through the doorway, keeping one eye on the broom that Mrs. Green held in her hand. And as soon as he was safely outside he gave two or three sharp yelps, telling Miss Kitty Cat that he would watch for her the very first time she set foot in the yard.